Nope, Sony's bad PlayStation 3 update from last Tuesday that bricked some consoles wasn't a secret ploy to encourage more PS4 pre-orders--although for anyone affected it may have felt like it at the time. As promised, the company released an update to fix borked PS3 consoles on Thursday. The fix for firmware version 4.45 is showing up more than a week after the first signs of trouble appeared. Anyone with a messed up console is going to have to jump through some hoops to fix their boxes. You can find complete instructions as well as the update's installation file on Sony's website, but before you get started you're going to need to have a PC and a thumb drive handy. Sony says you need at least 168MB free space on your storage device, but when we downloaded the PS3 update from Sony's site it weighed in at 194 MB. To be on the safe side, make sure you have at least 200MB free, which shouldn't be a problem for most folks. Once you've downloaded the software fix onto your PC, you have to create a folder named PS3 and inside that folder create another one titled UPDATE. 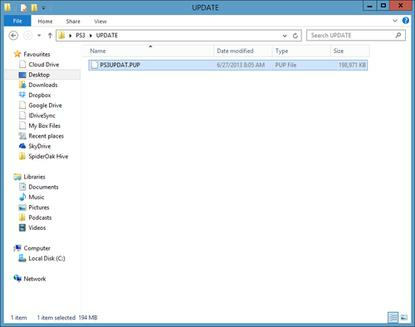 This is where you stick your download, like so: PS3>UPDATE>PS3UPDAT.PUP. Make sure both folders use all uppercase letters or your PS3 won't be able to find the file. Once that's done, you have to boot your console into safe mode and smash some buttons together to get the PS3 to update itself. If you don't know how to boot your console into safe mode, check out the detailed instructions at the Sony link above. Users of Sony's 4.45 firmware aren't the only ones complaining about bricked consoles. Some people in Sony's forums are also complaining that version 4.41 also messed up the PS3. It's not clear if Thursday's fix solves the problems for anyone experiencing difficulties from the 4.41 update.